After securing their spots in the OFC Champions League 2018 Quarter Finals Lae City Dwellers and Nalkutan FC have set up a Match Day 3 showdown tomorrow to decide who will get home advantage, while the look of the bottom half of the standings will be decided when Tupapa Maraerenga and Ba FC meet. With both sides hoping to leave Port Vila with some consolation points in their hands, it’s bound to be an exciting match-up and will provide a perfect entrée to the final Group A match which sees the top two sides meet in the decider. Whoever wins gets a home quarter final and both Nalkutan and Lae City Dwellers want to reward their loyal fans with that prize. Having already set history in motion with their respective exits from the group stage of the OFC Champions League for the first time, this match should be a thriller. Lae City Dwellers are an organised team that relies on speed, skill and organisation to undo its opponents. Raymond Gunemba, even when unwell, has shown his class in the two previous matches and with four goals remains the groups leading scorer. But he’s not the only talent in the squad. Obert Bika is a rising star of the same vein and given a bit more time to hone his accuracy, will soon be just as lethal as his teammate. Nalkutan FC isn’t lacking for attacking talent either, although will likely feel the loss of both Solomon Islanders James Naka and Joses Nawo who serve suspensions for the final match. However Raoul Coulon showed he’s a crucial cog in the team line-up and if Azaraiah Soromon and Daniel Natou can live up to expectation, Lae’s Ronald Warisan will have his work cut out. 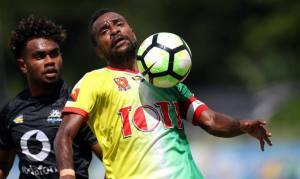 Vital Statistics: Lae City Dwellers met Vanuatu’s previous OFC Champions League debutants Malampa Revivors in 2017 in Auckland winning 5-2. The Players: Tutizama Tanito was the author of a crucial goal against Ba which secured his side the win. Often playing in the shadow of older brother Raymond, Troy Gunemba is emerging as a hard working midfielder. If he keeps a cool head he’ll continue to run the operation and play supplier to the front line. Vital Statistics: Nalkutan are yet to concede a goal in this competition and are keen to take a clean sheet into the quarter finals. The Players: Raoul Coulon made an early exit in game one and come Tuesday it was obvious what a loss that was. A midfield maestro he pulled the strings acting as link between back and front, and topped it off with a goal.